I think this is very French of us. How is this French of us? No! If Jake and Jane were French, they’d still be married to each other; he’d be having an affair with a younger woman while she might be having one with a younger man. What the Adlers are having is actually the inverse of a French arrangement, one that exists mainly in Nancy Meyers’ imagination. But hey, it’s all in good fun. I love dreams as much as the next moviegoer, honestly I do. And I understand why the restaurateur, architect and lawyer in this movie are rarely shown working. But I really think Meyers should consider matching her characters’ occupations, as little as they practice them, to their standard of living. Thus I’m looking forward to seeing royalty, industrial tycoons and Third World despots cavort in Meyers’ next impeccably set-decorated comedy. Complicated, to be sure, but only fair. Near the intersection of Mulholland Highway and Canyon Lake Drive, a mile-long trail runs from Castillo del Lago–a.k.a. the Madonna House, nicknamed for you-know-who, though she no longer lives there–to Wolf’s Lair, a sprawling white castle on Durand Drive. (More on both those landmarks in future posts.) 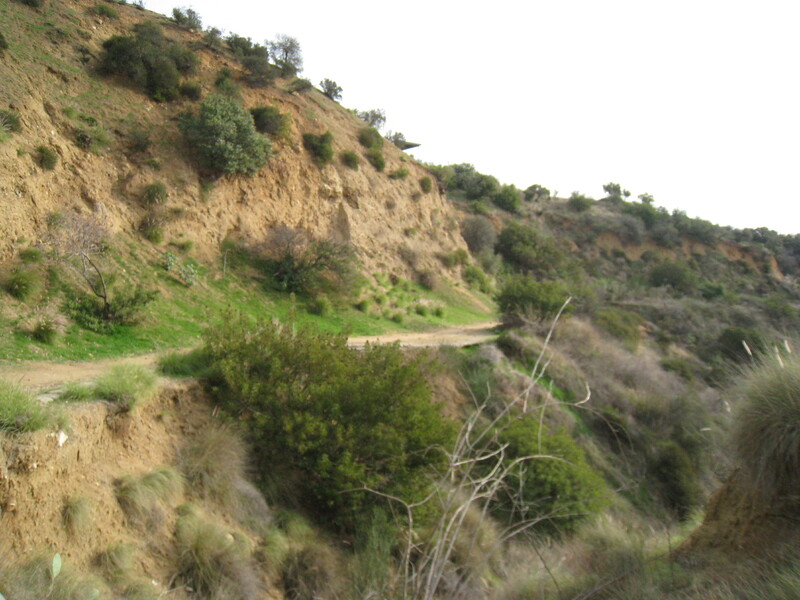 The trail, which features spectacular views of Lake Hollywood, is a favorite of Beachwood Canyon hikers and their dogs. It’s a magical spot, one of a handful in Los Angeles that makes people forget they’re living in a city. In springtime, wild grasses grow so luxuriantly that the trail seems new and untouched. During the summer the dense foliage turns brown, leaving the trail wildly unkempt and hard to navigate. 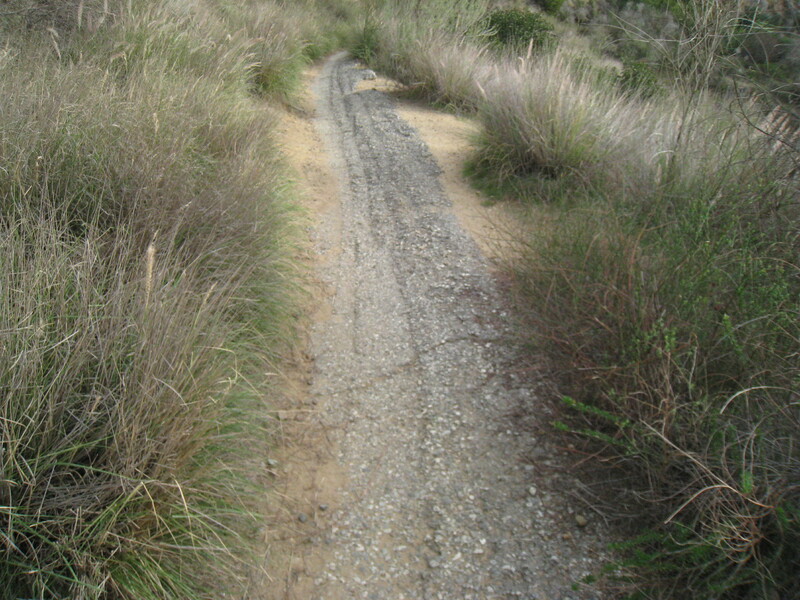 In autumn the trail comes to life again, growing green after the first rains. 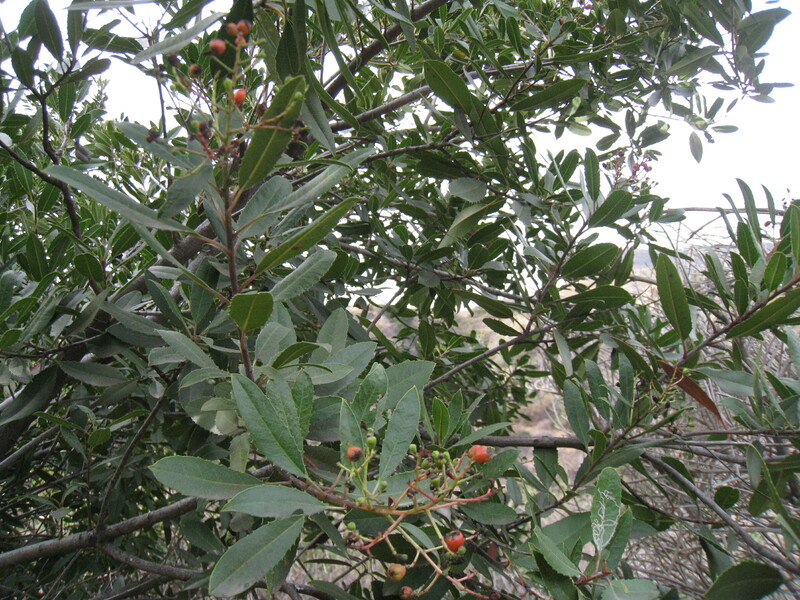 And late in the year, there’s a surprise: red berries on the native holly trees (toyon) that grow alongside it. 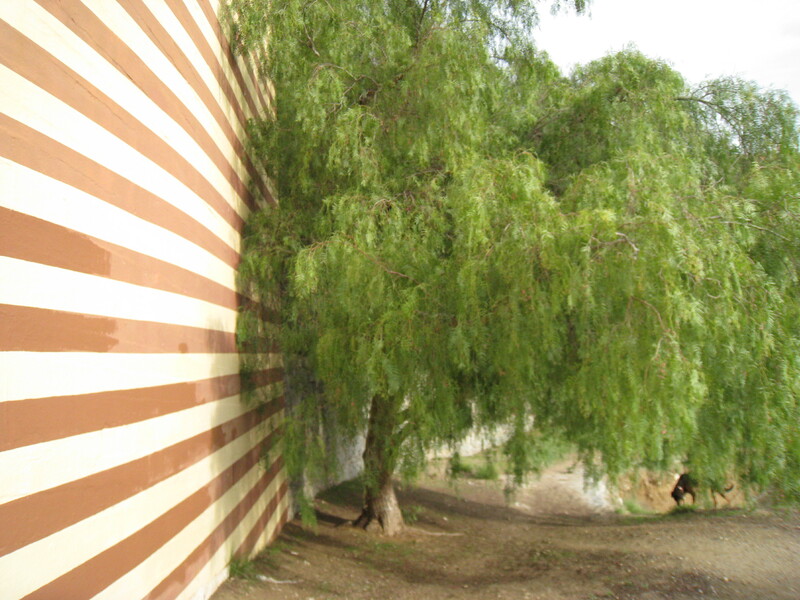 The trail has landmarks: a huge California pepper tree, abused last year by vandals, flourishes near the striped retaining wall of the Madonna House. 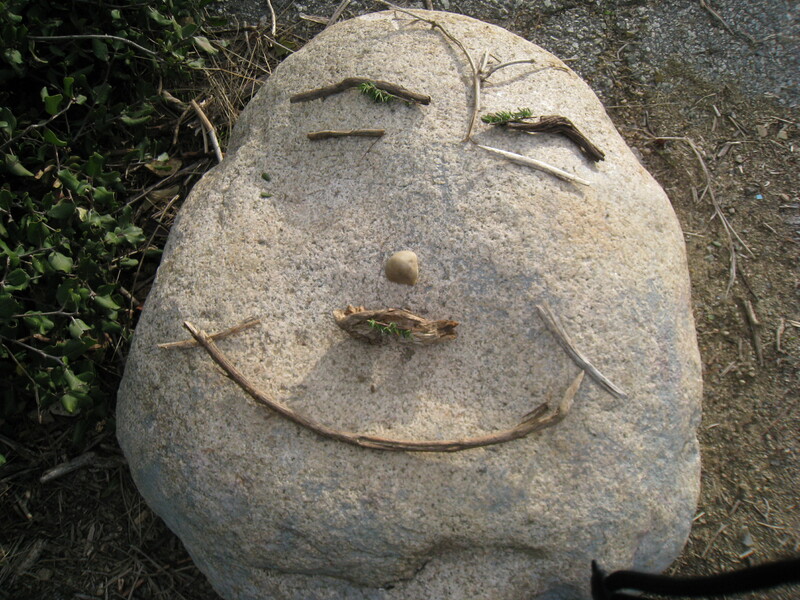 Closer to Wolf’s Lair there’s a large flat rock decorated with stones, flowers and branches to resemble a face. Constantly rearranged by passersby, the Face Rock is an almost human presence, marking both the seasons and one’s progress on the trail. Looking down at Lake Hollywood, one can spot herons and other waterfowl that make their home there. 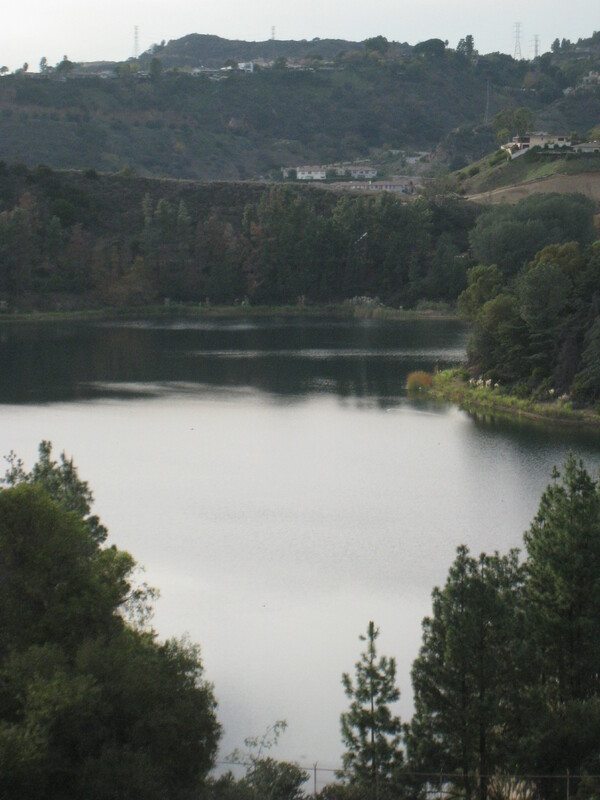 Built at the same time as Hollywoodland (1923 to 1925), the Lake is the crown jewel of the water system built by William Mulholland, the chief engineer of Los Angeles. After I moved to Hollywoodland in late 2005, I took to hiking the trail with my dog and wondered about its origins until my neighbor Anita Gordon (now sadly deceased) told me it was intended as an extension of Mulholland Highway. The evidence is clear: although for the most part packed dirt, there are paved sections that poke up at odd angles amid the grasses. The paving–concrete studded with pebbles– dates from Hollywoodland’s beginnings in the mid-1920’s. If fully paved, there would have been a drivable road to Toluca Lake. Why did the paving stop? Perhaps the tract owners, along with developer S.H. 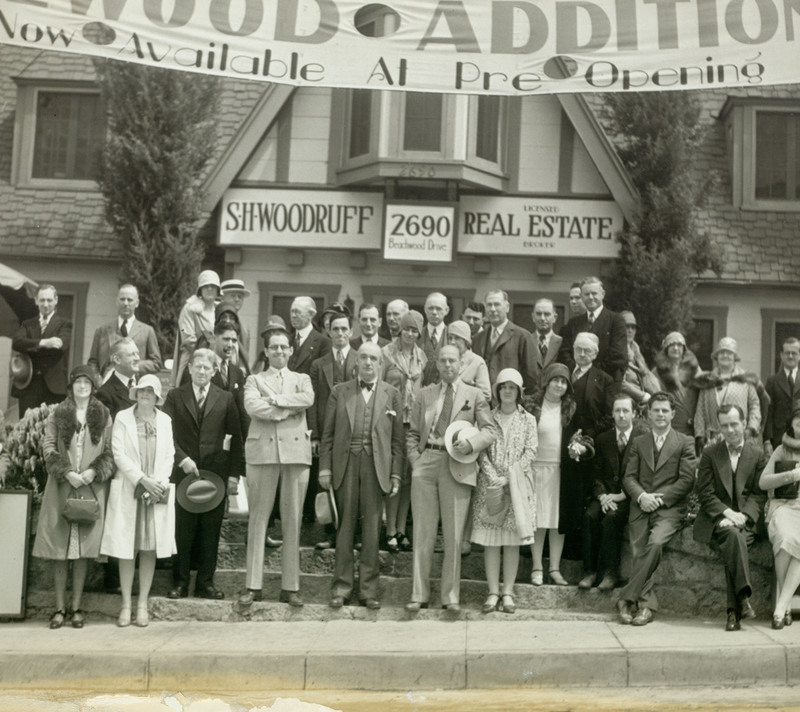 Woodruff, decided Hollywoodland’s appeal depended on its isolation both from Hollywood and the Valley. By making the neighborhood accessible only via Beachwood Drive, the tract would maintain its tranquility and rural character–the very qualities promised by radio and print ads across the nation. It wasn’t until the late 1950’s that Canyon Lake Drive was built, connecting Beachwood Canyon to Toluca Lake. Still, the route to the Valley remained relatively unknown until a 1989 book called LA Shortcuts revealed it; Beachwood Canyon has been plagued by commuter traffic ever since. Charisse Landise is a Beachwood Canyon resident and clairvoyant healing artist with a keen sense of the supernatural. We first met three years ago when I interviewed her on the significance of the Hollywood Sign for my documentary; since then we’ve talked periodically about Beachwood Canyon’s history and notable past residents. It was Charisse who had the vivid dream about Peg Entwistle described in Part I of my Haunted Hollywoodland series. After I posted a piece on Busby Berkeley (“First House North of the Gates: Busby Berkeley’s Home in Hollywoodland”), Charisse called me to tell me about an incident that happened last November, when she was working out of the day spa above Hollywoodland Realty in Beachwood Village. It was late afternoon but already dark when she arrived for a session and saw a male apparition sitting in the courtyard outside the Realty Office. He appeared to be in his late thirties and was dressed in narrow old-fashioned trousers and a top hat. He carried a cane. Though Charisse didn’t recognize him, she felt he was waiting for her. Unable to get any answers about his identity or motives, she went upstairs to meet her client. Once inside, she felt his presence in the spa. “He was definitely there as a curious witness,” Charisse says. “He was extremely fascinated with my healing procedure. I had the sense he had never seen anything like it. He was very unthreatening. I was challenged by the unexpected nature of his steady watchful presence.” The ghost observed her throughout the session and stayed behind after she locked up. “I didn’t know that was Busby Berkeley’s house next door until I read your blog, but I’m sure it was him,” she said. Unlike the house, whose entryway is now hidden behind a gate, the Realty Office remains open to the street, as it was in Berkeley’s time. The fact that the ghost appeared to be in his late thirties seems appropriate, as Berkeley was at the height of his success during those years. And a top hat and cane would be obvious props for a choreographer of movie musicals featuring scores of top-hatted, cane-wielding dancers. Contact www.charisselandise.com for further information. You are currently viewing the archives for December, 2009 at Under the Hollywood Sign.